To sum up, I loved this book. I was instantly drawn in through the opening scenes when Natalie is getting her hair done and just cannot bring herself to tell her hairdresser that she hates her new hairstyle – we’ve all been there and done exactly the same I’m sure! So there was an instant affinity with Natalie as the central character. Natalie’s also a bit too nice for her own good, not standing her ground when her wedding plans are overtaken by her mum and sister or when her fiancé is quite frankly rude and annoying. She’s not so nice that you just feel she’s a wet fish though, which was important; it wouldn’t have been the same book if I hadn’t cared and I did. I’ve been through a difficult time in my personal life lately and this book was a tonic and made me laugh again, just the book I needed! When I first read about the hypnotism element of the book I initially wondered whether it would annoy me and end up too surreal – I have to say Kirsty gets the balance just right with this plot – it provides very comical moments but it’s never over-done. There were definitely further opportunities where Kirsty could have played on this inability to lie further (e.g. at the beauty salon) but the way she worked it so the truth would only come out when asked a direct question worked well and meant it didn’t become grating or predictable, in fact I could forget about that side of the story at times as I was so engrossed in what was going on in Little Trooley. I am a born and bred Yorkshire lass, so I have to say I really loved the fact this book was set in the north of England. With the northern accents and the beautiful sense of place, I felt at home! I found this refreshing, as so many books tend to be set in major cities. I really developed vivid images of Little Trooley, particularly when Natalie gets snowed in. Although I read the book in the summer (well, an England version of summer...) it’s a lovely cosy read that will be perfect for autumn/winter when the nights draw in. I also enjoyed the many cultural references in this book, again very British and contemporary (even my favourite twins Jedward get a mention :)). The range of characters in the book was a strong point for me, the usual village mix, the ones you’re not sure can be trusted, the ones you think you can trust, the ones with family secrets, the ones that are just lovely and gorgeous..There was plenty going on in Little Trooley and back in Natalie’s hometown to keep my interest equally high throughout the novel, there were no lull points for me. As a reader you may think you know what’s going to happen but there are enough twists along the way to question yourself, and even the ending itself I was really pleased with as it didn’t quite fit with my expectations but in a good way. The book also leaves an air of mystery with it which I wasn’t expecting. I’m also grateful that this book has broken the Kindle spell for me. I’ve had my Kindle almost a year now and haven’t particularly bonded with it, if I’m honest. I’ve read a fair few e-books now and although they’ve generally been good, I just haven’t loved any of them and I wondered if it was any way related to reading them on the kindle itself, even though I liked to think not! 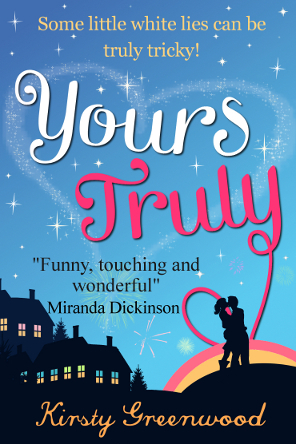 Anyway I’m pleased to say "Yours Truly" helped me to forge a bond with my Kindle at last, I couldn’t wait to pick it up each night. It’s definitely an e-book worth buying. 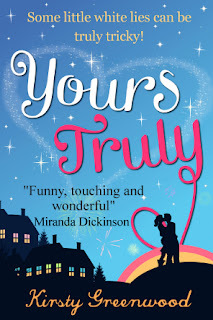 "Yours Truly" is one of those books where I’ve enjoyed it so much I’ve had to leave it a few days before picking up my next book, I wasn’t quite ready to enter someone else’s world when I was happy in the world of Natalie Butterworth and Little Trooley! Thanks to Kirsty Greenwood for the book in exchange for an honest review AND for sharing THREE Kindle copies to some lucky readers anywhere in the world! Since the title sounds like a way to end a note and it's still "back to school" month, please tell us: What was your favorite message written by someone in your yearbook? (One entry per person.) Please include your e-mail address or another way to reach you if you win. Giveaway ends September 23rd at midnight EST. favorite comment in my yearbook...hmmmm...well, the ones that make me laugh the most are "we'll definitely keep in touch" or "friends forever" because I talk to no one from high school. Whoa...I can't remember where my yearbook is. I don't think I let too many people write in it anyway. That was 45 years ago. There was one long meandering passage that really said nothing by a friend of mine but other than that probably the standard...let's always keep in touch. Haha I can't remember! I have to think really hard. I don't think anyone ever wrote anything memorable. I guess I liked the ones from my friends most. Favorite message: You are so sweet I don't know how anyone could ever be mad at you. Yearbook messages... my favorite included The Golden Girls theme song... "Thank you for being a friend... traveled down the road and back again..." Who doesn't love The Golden Girls??? A person I had a crush on, wrote about how they loved my smile, before I had braces, when I could have passed for a vampire because of the way my teeth were. Definitely the most memorable yearbook comment. Can't remember, but I think it was about staying in touch. Mine was from a friend who was so supportive throughout high school and wrote a message that brought tears to my eyes. We are still friends today. 1I can't remember what was written in my yearbooks! I didn't have a yearbook as I live in UK. I am French and we do not have a Yearbook in France but I can imagine that 'Let's get in touch' could have been written in it for I am still in touch with two friends I met at school 25 years ago. Thanks for opening the giveaway internationally. We didn't have a proper yearbook either, but we all wrote long messages in notebooks for each other. My favourite was my English teacher writing that she couldn't wait to read my first book! talk when we see each other around our town. "I hope your future success is just like your achievement in chemistry -- you did a great job!" This remark from my high school chemistry teacher always stayed with me, bridging my effort in that class to the idea that anything was possible in life! Honestly I can't remember. I usually liked the praise I received from the teachers lol. I liked when people wanted to keep in touch. I never got a yearbook, but I know the thing that everyone wrote in them was we will forever be friends. Your so nice never change.